Who says the street food craze can’t be brought home? This recipe while it may look daunting requires time for prepping the ingredients and is easy to make for a weeknight alternative to take-out. I give you the insanely good Mee Goreng recipe. Yotam Ottolenghi has really outdone himself with this recipe. I made it three times in the span of just as many weeks which could either mean I’m someone on a mission or someone who needs to plan a trip to Malaysia where this street food is regarded with fondness. 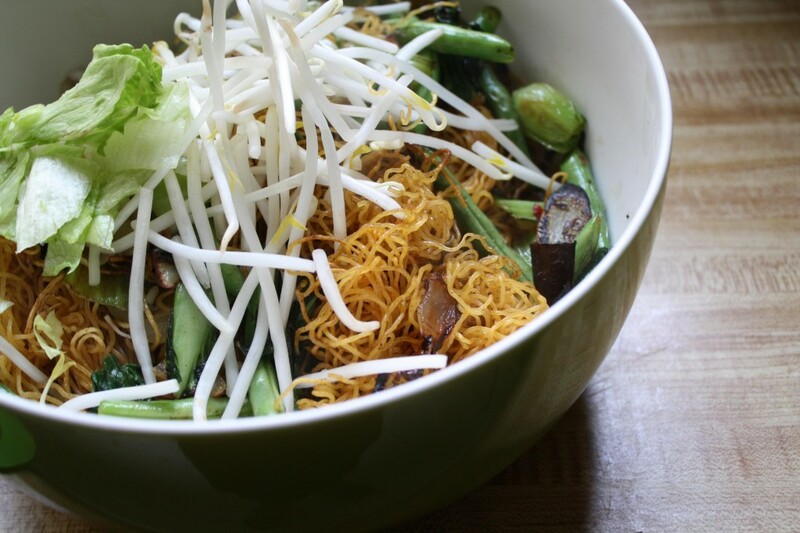 We recently discovered Mee Goreng on the menu of our favorite Thai take-out restaurant. Their version used thicker wheat noodles shellacked in a spicy sauce but missed the stir-fried vegetables and garnishes that make Ottolenghi’s recipe shine. Recipe by Yotam Ottolenghi from his cookbook “Plenty.” Reprinted with permission. Published by Chronicle Books. The original recipe in “Plenty” uses egg noodles (as pictured above) but I wanted to try a gluten free variation of this dish and after having tried it with egg noodles and then with rice noodles, found I preferred the rice noodles. I also substituted scrambled eggs instead of tofu and found that worked well texturally and flavor-wise. The original recipe also calls for 2 tablespoons of thick soy sauce and 2 teaspoons of light soy sauce. We opted to use the Liquid Aminos as that is a mainstay in our kitchen. Feel free to go the route that works for you. Lastly, I added sliced radishes as a garnish finding the crunch and slight zip of spice it lends to this already assertive dish one that is in good company. If you live in San Francisco and are looking to purchase sambal oelek, head over to New May Wah on Clement Street. Otherwise, purchase it online. 1. Set a wok or large pan on high heat. Once hot, add the oil and then the onion, and cook for about 1 minute to soften a bit. Add the sliced green beans and scrambled egg and cook for 2 to 3 minutes. Stir gently so as not to break up the eggs into pieces that are too small. 2.In a large pot of hot water, place the rice noodles to soak. Drain after 5 minutes and then set aside. 3. Next, add the bok choy. When it wilts, add the noodles and carefully spread them in the wok using tongs. You want the noodles to get a lot of heat, almost to fry. Mix gently, cooking the noodles for about 2 minutes. Then add the spices, sambal oelek, liquid aminos, water, bean sprouts and toss carefully. Cook for about a minute or until the noodles are semisoft. 4. When ready, top with lettuce, transfer to serving bowls and sprinkle crisp shallots and radish slices on top. On the side, serve lemon wedges and a small bowl of extra sambal oelek. PAIRING SUGGESTION: Try this with a chilled glass of Riesling. You can replace the noodles with rice for “Nasi Goreng” an Indonesian take on the same. Which leads me to believe you’ve tried it? This recipe is all about the prep work and comes together quickly as it’s made- my kind of weekday meal! Had versions of it in Malaysia & Indonesia. I, up to this point in my life, have been deprived of that uniquely joyous experience that is your cooking.